By car: Get on the ring-road and follow signs for the ring road – The Two Pigs is directly opposite Primark, on the left as you do laps of our pretty town. From London it’s a pleasant drive along the A40 all the way in. From the North, expect gnarly congestion on the M5 until you escape at Junction 10. By coach: National Express coaches run regularly to Cheltenham and arrive at Royal Crescent, 2 minutes walk from the venue. And you can have beer on the back seat as long as the driver doesn’t see you. By train: Cheltenham is embarrassed of its train station and thus keeps it 2 miles out of the town centre. Jump in one of the plentiful and courteous taxis outside the station and say in a clear voice “Take me to The Two Pigs, opposite Primark, my fine man”, sit back and enjoy the view. 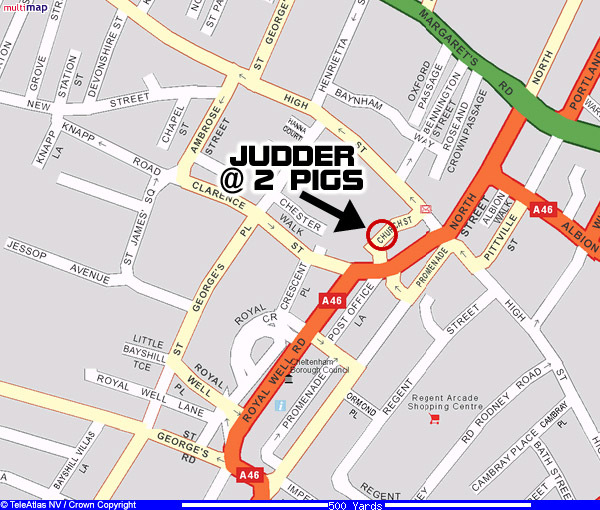 Judder is situated in the pleasant garden town of England that is Cheltenham – come for the Judder, stay for the breathtaking views of the Cotswolds, hazardously cheap beer prices and friendly welcome. London-dwellers: contrary to further belief, your hair will NOT fall out if you venture outside the M25 to pay us a visit. This has been proven with experiments and graph-paper.